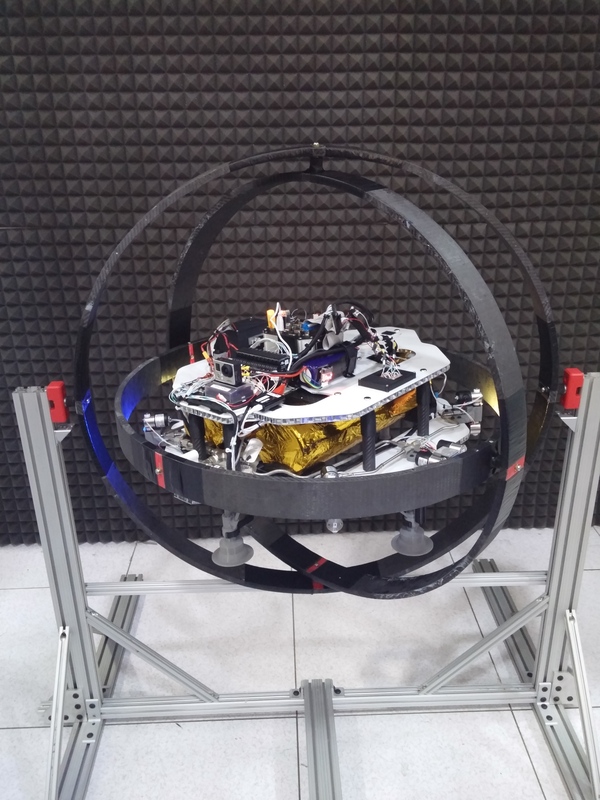 Swamp Works engineers at NASA’s Kennedy Space Center in Florida are inventing a flying robotic vehicle that can gather samples on other worlds in places inaccessible to rovers. The vehicles – similar to quad-copters but designed for the thin atmosphere of Mars and the airless voids of asteroids and the moon – would use a lander as a base to replenish batteries and propellants between flights. The machines being built fall under the name Extreme Access Flyers, and their designers intend to create vehicles that can travel into the shaded regions of a crater and pull out small amounts of soil to see whether it holds the water-ice promised by readings from orbiting spacecraft. Running on propellants made from resources on the distant worlds, the machines would be able to execute hundreds of explorative sorties during their mission. They also would be small enough for a lander to bring several of them to the surface at once, so if one fails, the mission isn’t lost. If that sounds a lot like a job for a quad-copter, it kind of is. On Earth, a quad-copter with its four rotors and outfitted with a digger or sampling device of some sort would be able to execute many missions with no problem. On other worlds, though, the machine would require very large rotors since the atmosphere on Mars is thin and there is no air on an asteroid or the moon. Also, the flyer would have to operate autonomously, figuring out on its own where it is and where it is going since there is no GPS to help it navigate and the communications delays are too large to control it directly from Earth. Cold-gas jets using oxygen or steam water vapor will take on the lifting and maneuvering duties performed by the rotors on Earth. For navigation, the team is programming the flyer to recognize terrain and landmarks and guide itself to areas controllers on Earth send it to or even scout on its own the best places to take samples from. “It would have enough propellant to fly for a number of minutes on Mars or on the moon, hours on an asteroid,” said DuPuis. For the sampling itself, designers currently envision a modular approach that would let the flyer take one tool at a time to a sample area to gather about seven grams of material at a time. That’s enough for instruments to analyze and, throughout the course of many flights, is enough to gather samples that would show Earth-bound scientists a complete geological picture of an area. It’s work that would’ve been too complicated to research even five years ago, particularly with off-the-shelf components. Now though, the advent of autonomous flight controllers, laser-guidance and mapping systems combined with innovations in 3-D printing make the chances of developing a successful prototype flyer much more likely. Also, a partnership with Embry-Riddle Aeronautical University and Honeybee Robotic Spacecraft Mechanisms is providing more expertise. In the Swamp Works laboratory, the team has assembled several models designed to test aspects of the final machine. 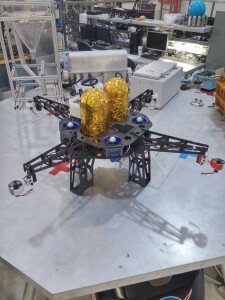 A large quad-copter about five feet across that uses ducted fans is about the size of the prototype the team has in mind for an operational mission in space. It’s been tested at the planetary surface analogous test site built for the Morpheus lander project at the north end of the Shuttle Landing Facility’s runway. 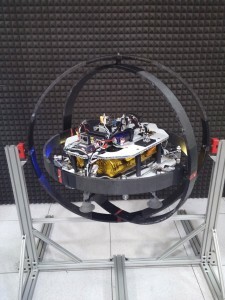 A smaller ducted fan flyer, about the size of a person’s palm is routinely flown inside a 10-by-10-foot cube to test software and control abilities. Another, primarily built with asteroid exploration in mind, is suspended inside a gimbal device that lets it maneuver much as it would in zero gravity, using nitrogen high pressure cold gas thrusters to tilt and spin while the team judges its behavior in a virtual simulated world on a computer that shows what its flight around an asteroid would look like. The team started at a low level of technological readiness two years ago and is steadily pushing the mission and design closer to a state where it can be made into a flight-ready craft. The uses for the sampling vehicle may not be solely extraterrestrial, Mueller said. On Earth, an aerial vehicle that can pull a few grams of dirt from an area potentially brimming with toxins would be very valuable for first responders or those researching a new area who do not want to risk humans. Mueller said the effects of a nuclear radiation leak on surrounding areas, for example, could be measured with soil gathered quickly by a vehicle like the Extreme Access Flyer. “We’re an innovations lab, so in everything we do, we try to come up with new solutions,” Mueller said. “You could put a whole habitat inside a lava tube to shelter astronauts from radiation, thermal extremes, weather and micrometeorites,” Mueller said.